Best Flight Bags (Pilot Bags) Compared: Which One Is For You? We researched over forty popular flight bags between pilots and flight attendants. Then we hand-picked the best flight bags (pilot bags) for flight attendants, student pilots, private pilots, and commercial pilots (ATP). Although the Brightline Flex B7 has won as the best overall flight bag, the Lightspeed Aviation Gann and the Flight Outfitters Bush Pilot Folio are both not far behind. Nevertheless, we’ll start by showcasing the winners, followed by what you should look out for when getting a flight bag, and in-depth reviews on some of the most popular models. A popular choice between flight attendants. Out of all the coolers available on the market, the Ebags crew cooler 2 is overall the best choice. A flight bag that not only looks good but is durable and organized. Best suited for private pilots and student pilots. When you’re choosing a flight bag, whether it’s your first one or you’ve already been through several, the most important feature to look at is its material. After all, this determines how long the bag will last when used frequently. Polyester is one of the cheapest fabrics used in bags & luggage. Most commonly it’s found in more inexpensive flight bags. It’s measured Derniers ranging from 600-1800 Derner Polyester, with the highest ones being more durable. When getting a polyester flight bag make sure to choose the highest possible Dernier, as the material will be more durable. Now when it comes to nylon, it’s much more durable than polyester. Although in Derniers it’s lower than polyester, it’s actually stronger. Cordura nylon usually ranges from 600-1800 Derniers. Nylon is thicker than polyester and better at repelling water. It comes at a price though because Cordura Nylon is more expensive than Polyester and typically used in medium-priced flight bags. In all the traditional fabrics used in flight bags, the Ballistic Nylon is the most durable and most expensive as well. These bags usually come in 1800-2500 Dernier Ballistic Nylon. If you get a bag made from this material, you can be sure that it will last for a long time. Although both Nylon and Canvas are durable, Canvas is more durable than nylon. Canvas is more fabric-like, more massive, and less water resistant. When it comes to flight bags, most commonly Flight Outfitters are using this material instead of regular nylon to get better looks and improved durability. Usually, these bags are pretty large and heavy, but in return, they’re much more durable than Nylon flight bags. In general, leather is much more resistant to scratches, stretches, bends, and other forces, so they usually last longer. It’s pretty standard for leather bags to last even a few decades. One minus though is that they’re less water resistant and heavier than nylon or polyester. If a flight bag is made from real leather, expect to pay a premium price, because leather isn’t cheap. A piece of advice would be to not go overboard with compartments. On the one hand, they do help with organizing, but on the other, they limit the total available space in your bag. Three to five smaller compartments for chargers, flashlights, fuel testers, sunglasses, and other smaller items. A larger compartment that can hold a few pieces of extra clothing in addition to your flight gear. When you take a look and what an average pilot has to carry, you can easily understand why all flight bags offer so many compartments. It’s important to stay organized on your flight and have everying at a hands-reach during flight. In general, you don’t want your bag to be too large. However, this heavily depends on what aircraft you’re flying. When you’re a pilot, It’s best to keep your bag right next to you next to the pilots’ chair, rather than behind it. Often you’ll need to reach and take some items out of the bag and having it right next to you makes things so much easier. A pilot suggested that having a bag that’s under 18 x 14 x 12 inches will be enough to fit in the most cockpits right next to the pilots’ chair. If you’re a flight attendant, you’re not so strict on space. I’ve even seen some flight attendants use large 25-inch hard case trollies as their flight bags. I’d suggest that you not do that and follow the minimalism principles: Choose a bag, that’s just the right size, no more. Generally, a smaller duffle is enough in combination with an overnight suitcase. If you’re flying commercially and you don’t return to your home base often, you will need to take a second overnight carry-on stuffed with additional clothes, toiletries, and other items. There’s no going around that. If you have to do it often, I suggest that you get a flight bag with a rear strap, that’s meant to wrap around your carry on and hold it on top of it. That way, you won’t have to carry two separate bags. We’re not talking about carry-ons in this article, but while we mention them, I’d suggest that you get a durable one. You’ll be (Or already are) flying way more often than most people, and you need something that won’t break. We’ve been impressed by the durability of Travelpro luggage. They offer a lifetime warranty and are built for frequent flyers. I’ve talked with several airline pilots, and what stood out to me is that nearly all of them suggested only a few brands for their carry-on choices and flight bags. Some stated that they’d had their bags for over 15 years without any problems. This makes me believe that paying additional 50$ or 100$ for a brand name can pay-off in the long-run. I’m not saying that other ones are bad, but these continually popped up as the best choices between most pilots. Most pilots are faced with the following issue: Sometimes they have to fly for a week, yet sometimes they’ll be gone only for a day. Or one day they’re flying commercially, and the next they’re flying a private plane. The point is that sometimes they’ll need a small bag and sometimes a larger one. Should they purchase two or three bags and swap between them? That’s where Brightline comes in to play with its modular design. The Flex B7 flight consists of several smaller models that can be used separately and are held together by zippers. 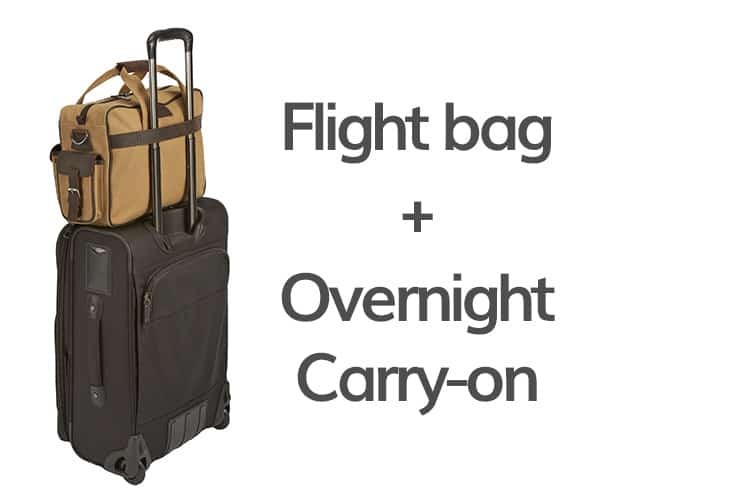 They can be swapped or removed to fit your current flight best, resulting in four different bags for the price of one. For instance, for shorter trips, you could remove the CS3 section and end up with the B4 SWIFT model, which more compact. The Brightline Flex system has a ridiculous amount of compartments, and everything is made specifically for pilots. It’s like a well-made lego set – everything is there for a reason. But it does come at a price. The Flex B7 flight is priced pretty high when compared to other models, but you do get a three-year warranty in return. When using all of the modules, you can fit two full-size headsets, an Ipad, a handheld radio, a full suite of charts, a few pieces of clothing, and other smaller items that you would need on your flight. It has a top handle and a shoulder strap for more comfortable use. A nice feature to have is the rear strap that you can use to secure your flight bag on top of a rolling carry-on for your longer flights. In fact, this bag isn’t just great for pilots; it’s also great to use if you’re a photographer and need to carry various pieces of gear with you all the time. In my opinion, it’s great for all types of pilots, just because you can tailor your bag to your specific needs. If you’re just looking for a cooler for your daily food and snacks, the Ebags Crew Cooler 2 is the best option out there. (Although the Travelpro cooler is decent as well) It’s got a history, and the customer satisfaction scores from flight crew members have been really generous. Above all, it’s impressively affordable. If you have been working as a flight crew member for a while, the chances are that some of your colleagues are already using it due to its popularity. The crew cooler 2 isn’t too large, as it’s designed to fit only food and snacks. For your food, you get two compartments: the first one for your dry food and the second one for your food that needs to keep a low temperature. The top dry compartment isn’t too large and will mostly fit only snacks and maybe a bag of oats. The cold bottom compartment is more massive and insulated by a replaceable liner, that keeps the contents cool enough. As for the cooling technique, it’s best to use a small freezable liquid pack, which will be good enough and won’t result in your food getting wet. This compartment keeps your food cold for about 6-12 hours. On the exterior, you’ll get a large front pocket and a small side pocket which are great for smaller snacks, like oat bars, nuts, and other snacks. It’s fitted with a top handle, shoulder strap and a rear strap for securing the cooler on top of a rolling suitcase. If you don’t have a cooler yet, it’s a great way to save some money on food, or if you’re on a diet, keeping your self-made food fresh. This one made by Ebags is a solid choice that comes at an affordable price. What defines the flight outfitters bush pilot duffel bag is its durability and space. Although they market it as a flight bag for pilots, it’s pretty much amazing for flight attendants as well. If you’re gone for a few days, you could easily fit everything in this bag. Right off the bat, the bush pilot duffel doesn’t come cheaply. Out of our top picks for flight attendants, this one is the most expensive one. It’s made from canvas, which is stronger and more durable than polyester or nylon, accented with several leather elements. The zippers are strong and durable, and so is the shoulder strap. Overall, this duffel should last a long time, as it’s explicitly made for frequent use. The overall organization is reasonably straightforward. You get two padded side pockets meant for headsets that are perfectly sized to fit some food and snacks in one pocket and some smaller gadgets and chargers in the other one. In the front, you get a smaller pocket with several smaller compartments in it for better organization. It’s perfect for keys, a mobile phone, a pen, sunglasses, and several other smaller items. The main compartment is huge and can easily fit clothing for several days and some food. Additionally, the bag comes with a rear strap, so you can quickly secure your bag on top of a rolling suitcase. It’s beneficial if you’re gone for a longer time and need to bring an overnight carry-on as well. Also, the bag looks nice as well, with the light brown exterior and orange interior. If you’re looking for a flight bag that will last a long time, the fight outfitters bush pilot is a great choice. The Travelpro Crew tote has been around for a long time. The latest model Crew 11 deluxe tote is the perfect flight bag for shorter trips, where you’re gone for one to three days. Above all, it’s not priced too high, yet is durable enough to withstand frequent use. Travelpro has always been favored by flight crews. The company itself was founded by an airline pilot over forty years ago and now supplies flight gear to over ninety airlines. So naturally, you’d expect the bags to be durable. The crew 11 duffle is made from ballistic nylon, which is one of the stronger materials used in bags & luggage. It also comes with a shoulder strap and a top handle that’s made from leather to make it more durable. The bag itself isn’t too large; its volume is 26L, which is enough for one to three-day trips. If you’re gone for a longer time, the Crew 11 tote fits perfectly on top of an overnight rolling carry-on, by having a rear strap that fits around the handle. The bag is equipped with a front pocket that comes with several smaller compartments for your documents, mobile phone, a pen, notebook, and other small items. It also has a side pocket that’s made for securing an umbrella or a water bottle. In the main compartment, you get a smaller compartment for your toiletries and smaller items. Other than that, the main compartment is pretty spacious for a duffle of this size and can easily fit spare clothing for a few days and some food. The bag is overall not too expensive and a good choice for most flight attendants who don’t want to overpay. Although the Flight Outfitters Lift flight bag isn’t too large, it’s packed with smart packing features and made to last. Small size isn’t necessarily a bad thing, because the aviation industry has transformed from needing to carry several pounds of paper charts to only a few electronic devices. As it’s made specifically for private pilots and student pilots, the size of the bag is on-point. What defines the Flight Outfitters lift is its durability and smart packing features. It’s made from durable ripstop nylon and has reinforced wire handles for additional protection. 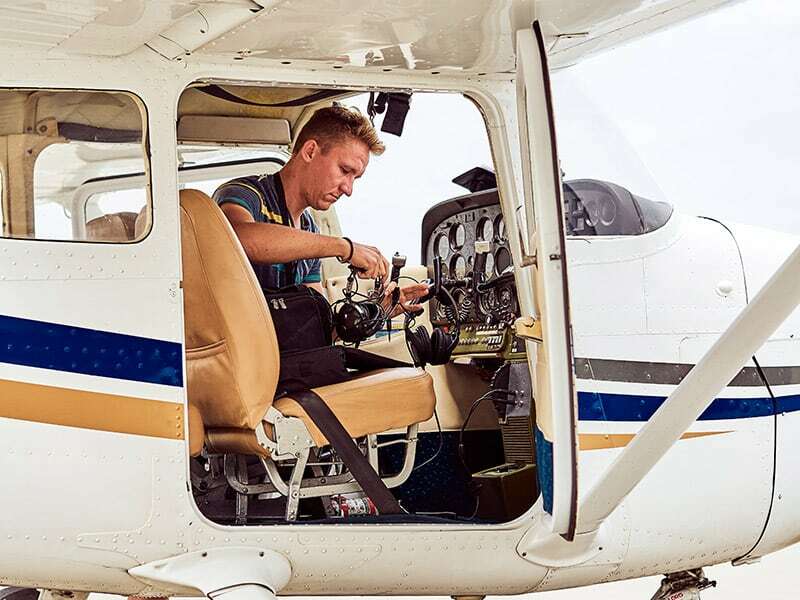 Although the bag doesn’t have a rear strap for securing on top of a carry-on, it does have a shoulder strap, which is more than enough for student pilots and private pilots. Inside, you’ll get a padded iPad pocket, a padded pocket for your headset and its batteries, and a pocket with various organization features for your Gps, cables, cords, sunglasses, keys, phone, and other smaller items. On one side, it has two dedicated pockets for the fuel checker and a flashlight, and on the other, you’ll find a pocket for your radio or a water bottle. It’s priced at around one hundred dollars, which is in the average price range for private pilot bags. You can tell that the bag is made by professionals and made explicitly for private pilots and students because every compartment and pocket is made there for a specific in-flight device. The Flight Gear HP crosswind is a great bag for student pilots because it’s affordable and roomy enough to fit extra books that a student pilot might need. Flight Gear is other known as Sportys pilot shop, a website that sells pilots gear. They do have enough background experience and previous models released, so it’s a pretty safe company to purchase from. The Flight Gear collection is aimed mostly at student pilots and private pilots. Right off the bat, the bag comes with a top handle and a shoulder strap. Unfortunately, there is no rear strap, so you won’t be able to secure this bag on top of a carry-on. Not a huge problem though if you’re a student pilot or a private pilot. From the exterior, you get two back slide-in pockets for your charts, a side pocket for a water bottle and a few pens, a side pocket for your headset and a front pocket for items, like sunglasses, a notebook, a mobile phone, and other smaller things. The inner compartment is quite roomy, and you should be able to fit your log book, and iPad, a kneeboard, a transceiver, if needed a second headset, and other items. Optionally, you can purchase additional gear mods from their site, like a headset pouch, an iPad bag or other things that make the overall organization in the main compartment easier. Although we think that the bag could be improved in its design, it has some really nice features to offer and is priced pretty cheaply. It’s a solid choice for a student pilot or a private pilot. For a few dollars extra, you can get the Flight Gear HP Ipad bag, instead of the Crosswind. This bag is slightly smaller, and a has a dedicated laptop pocket. In its design, it’s slightly similar to the Flight Outfitters Lift, yet costs a few dollars less. Aside from the dedicated laptop pocket, you’ll get a large main compartment that has a pass-through hole to the iPad compartment for charging. In the main compartment, you’ll be able to fit your headset, a power bank, its batteries, and a few other items. There’s a unique hanger for your headset in the main compartment, which is a nice touch. From the exterior, the bag is equipped with two sleeve pockets for your charts, a side pocket for a water bottle, a shoulder strap, a special compartment for the radio and a custom organizer in the front where you can store several smaller items. In features and design, it’s pretty close to the Flight Outfitters Lift, but we still think that the Lift is slightly better. In its design, both the Markham and the Gann by Lightspeed Aviation are clear winners. If you’re looking for something that’s classy, professional and sleek, check out the flight bags by Lightspeed Aviation. The Markham is a slightly smaller and cheaper option next to the Gann. They’re both made from full-grain oiled South American cowhide that won’t degrade with use, instead of nylon, polyester or other fabrics. It comes at a price though, because both bags are some of the most expensive ones out there. Unfortunately, the bag doesn’t have a rear strap for securing it on top of a smaller carry-on, but it does have a top handle and a shoulder strap. On the front part, it’s equipped with a pocket that has several smaller compartments inside for packing your gadgets, pens, logbooks, e.t.c. Additionally, you’ll get a side pocket for your radio and another side pocket for your water bottle. The back pocket is perfect for fitting your iPad. The main compartment is pretty spacious and in stock doesn’t offer any other compartments for smarter packing. However, for a few bucks extra, you can get a Lightspeed Aviation bag insert that’s awesome for storing your headset. Other than that, the main compartment is spacious enough to fit your headset, a logbook, spare clothing, and some snacks. Overall, this bag is an excellent choice and looks good enough to be used for regular traveling or daily use. It’s highly priced, but will last a lifetime and is one of the most durable options mentioned in this list. Another good-looking bag from Flight Outfitters in their signature light brown canvas style. It sure is one of the best-looking flight bags out there, and you wouldn’t have any problems using it daily as well. Aside from the good looks, it’s also practical. First off, it’s made from canvas fabric with leather accents. By the way, canvas fabric is more durable than regular nylon or polyester. It comes at a price because the bag is pretty expensive, though not as much as the leather Lightspeed Aviation models. The bag does come with a top handle, shoulder strap and a rear strap for securing on top of a rolling suitcase. From outside, you get dedicated pockets for your fuel tester and flashlight on the left and a radio pocket on the right. From the front part, you get two smaller pockets and one larger pocket for organization of your smaller items. Inside, you’ll find another smaller pocket for organization, where you can keep your pens, sunglasses, keys, e.t.c. Other than that, the main compartment is pretty large and should fit your headset, kneepad, iPad, and other items reasonably easy. You could squeeze in some spare clothing as well. Overall, the Flight Outfitters Bush Pilot Folio bag is very well made and good looking. If you want a multi-use bag that you can use on the weekends and meetings, it’s a great option. Although the Mygoflight PLC Sport is quite expensive, it’s packed with many smart features and built from extra strong materials. 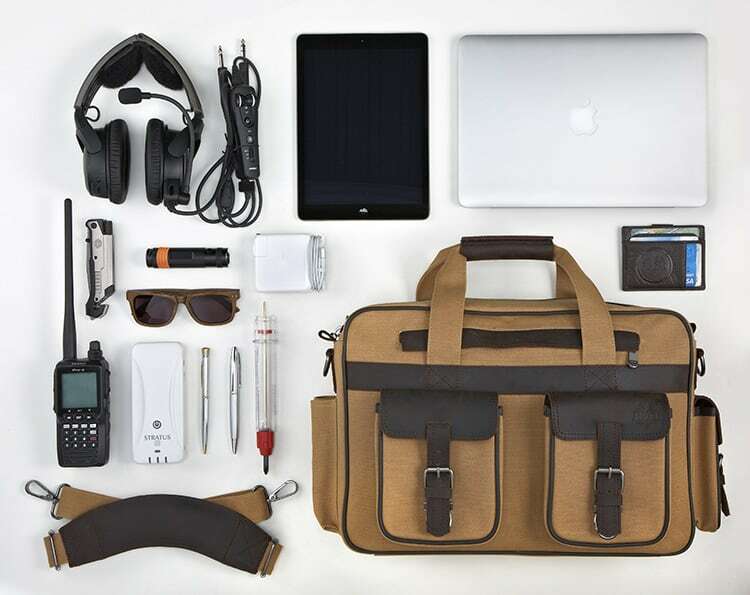 Aside from the design, the bag is an excellent option for private pilots. From outside, it’s built from waterproof and robust sailcloth. It’s the only water-resistant bag that’s included in this list. The top handle is made from a flexible wire for additional durability. Combined with sturdy zippers, the bag indeed is built for frequent use. If you don’t want to carry it in your hand, the bag comes with a shoulder strap and two straps to transform it into a backpack. From the exterior, the PLC Sport comes with a radio/water bottle side pocket, two additional side pockets for smaller gadgets and an accessory compartment from the front. The inside compartment is fitted with a padded laptop pocket that fits tablets and laptops up to 13 inches, and a few mesh pocket organizers. Aviation Consumer also agreed that it’s one of the best flight bags for private pilots and we agree. Although the Alpine Swiss rolling brief isn’t made specifically as a flight bag, we’ve included it as a good option for commercial ATP pilots. The main reason is that we’ve heard many good reviews from other commercial pilots using this bag. Because it’s not a real flight bag, it’s more popular and has received much more reviews than any other bag on this list, and frankly, they’re good ones. Although you would think that a briefcase made from artificial leather wouldn’t be too durable, the reviews say otherwise. The inner parts of the brief are made from durable plastics, and only the outer parts are covered with artificial leather. This bag is one of the largest ones included in this list, so naturally, you would be able to fit clothing for several days in addition to your flight gear reasonably easy. In the smaller other pockets you would be able to fit only some documents or other slim items, so you would have to fit everything in the main compartment. Inside, there’s a sleeve for a 17-inch laptop or a tablet, several smaller compartments, and a pretty massive main compartment. You would have to pack smart and put all of your flight items on top so that you can reach them quickly. Although this briefcase doesn’t offer the best packing features, it’s cheap, popular among commercial pilots, and looks professional. Although this bag is slightly smaller than Alpine Swiss, it’s way more efficient in packing your flight gear, made from real leather, looks better and is much more durable. It all does come at a hefty price tag though because it’s the most expensive bag in this list. Because the bag looks so good, you will be able to use it in other situations as well. It’s made from full-grain South American cowhide which should last at least a decade of heavy use. When it comes to carrying options, you can either take it by the top handle, a shoulder strap or secure it on top of a rolling carry-on with its rear strap. On the front part, you get two pockets, one for your radio and the second one as an accessory compartment where you can store all of your smaller items. The main difference from the slightly less expensive The Markham bag is the inner compartment, which is way bigger and has much more organization to it. Inside you’ll find a zippered iPad pocket, a particular slot for your headset, and next to it another compartment where you can store your go-to flight essentials, like the fuel tester, a flashlight, a mobile phone, and sunglasses. Other than that, you can fit a few extra spare clothing items as well. Overall, a beautiful bag that’s made from quality materials and built to last. We’ve rated it the highest out of this list, but it’s priced pretty high.